You’ve just been hired to to build a retaining wall and a few plant-bed borders for a new client. The only issues are that you’re working in a tight space and the customer wants a beautiful finish on both sides of their walls. Traditional options just aren’t going to work– split-face walls need to be terminated in a hefty column that takes up too much room and only looks “good” from one direction. Veneer walls can have the two-sided finish your client is wanting, but your crew will spend three more days on the project. You’re running out of options. Fast. To make matters worse, it’s summer and there’s always a big storm looming every afternoon, and you have a backlog of jobs. Any rain at the wrong time will affect the curing process of any masonry you lay. You begin to add up the total cost of labor and loss of income from missed opportunities due to taking too long on this job and you realize, that because of the situation with the walls, you will stand to lose quite a bit of money and the opportunity to make more money. How can you complete the project on-time and under your labor budget while still making sure your client gets exactly what they want? You have to find solutions that are beautiful, flexible and easy to install. 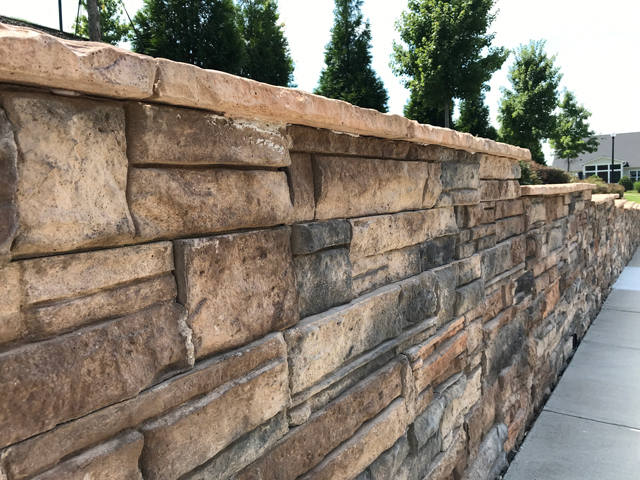 What was once an impossible situation is now made possible with the introduction of Heritage Block retaining walls and accessories. The process to lay Heritage Block is simple; if you know how to lay traditional methods, you’ll find using Heritage Block to be even simpler as no custom pieces like clips or pins are needed. Ground preparation is the same as veneer or split-face methods– there just needs to be a larger area excavated because the base of Heritage Block is slightly larger to help ensure stability. From there, after making sure everything is level, it’s easy to stack and fill simultaneously– without having to wait for the 24-hour cure time for veneer.. You’re in and out in almost half the time and your customers will be delighted with a better product.